Lassnr! Tymvaul has fallen in the well! Talk to Lassnr in the Skaal Village and receive a well key. Follow the tunnel in the well and enter Rimhull. Find Tymvaul and decide how to handle the situation. Inside his house in the Skaal Village, Lassnr will ask you to find his son, Tymvaul, who recently fell into the well. Beneath the well there are the Rimhull caves and he hopes his son is somewhere there still alive. Agree to help and you'll receive a well key to give you access to the well and Lassnr mentions that there is probably another entrance to the caves if you can find it. The well is just behind Lassnr's house to the west and there is another entrance to Rimhull a little to the south of that entrance, down the hill and close to the river. If you enter by the well entrance you'll find yourself underwater on the other side, but it's a short swim to exit the water. 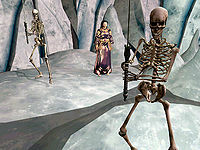 The cave is populated with a number of undead, mostly skeletons, which are not too tough if you can fight them one at a time. If you tell him that he's insane and must die, you will obviously fight with him. After you killed him, you can tell the truth to his father or lie. Telling him that you have killed his son, will make him attack you too. Lying instead, saying that you've found his son already dead, will make him sad (but will increase his disposition to you) and he will reward you with two snow bear pelts. If you tell him that you are sent by his father and try to convince him to take off the robe, he will understand that his father truly loves him, he will give you the Mantle of Woe and tell you that he will leave Solstheim in order to study magic better. Reporting the good news to Lassnr will make him extremely happy (again increase of disposition) and he will reward you with five snow bear pelts. This will also make disappear Tymvaul from the game. If you tell him to join forces and bring death to Solstheim together, he will refuse and attack you. Once again, if you tell his father the truth he will attack you too. Lying instead, will make him reward you with two snow bear pelts. If you tell him that this is not your business and you're going to leave, he will try to stop you attacking you. Once he's dead, again, you can tell the truth to his father, causing him to attack you too, or lie and receive two snow bear pelts. If you tell him that he's too weak to wield such power and that you want his Mantle, he will of course attack you. As for the previous options, you will be able to tell the truth or to lie to his father. The "good" and best option is obviously the second one, convincing Tymvaul to give up the robe and also being rewarded with five snow bear pelts (useful to craft armors). Any other option will allow you to kill Tymvaul but get, at max, only two pelts. Killing him and telling the truth to his father will give you, as the only positive note, the chance to use Lassnr's house for yourself, since the owner will be dead. But you can also kill him after he gave you the five pelts, getting the most from this quest. Whatever, you get to keep the very interesting magical robe. It seems Tymvaul was doing some experiments in the dark arts before he entered the well. In Lassnr's house, you'll find a basket of skulls, some interesting books on necromancy and other dark subjects, as well as some very rare ingredients: ghoul heart, human flesh, and wolfsbane petals (this is the only place to find wolfsbane other than a single plant atop Hvitkald Peak). If you encounter and kill Tymvaul before receiving the quest, Lassnr will know of his death (though will not seem to blame you for it), and will have no dialogue other than his grieving. 10 While in the Skaal Village I met a sad old man named Lassnr, whose son Tymvaul fell into the well while getting water. The bottom of the well leads to an ancient series of ice caves known as Rimhull, and Lassnr is convinced that Tymvaul is still alive down there and waiting for rescue. 20 Lassnr pleaded with me to try and locate his son, Tymvaul, who he believes is trapped in the Rimhull Ice Caves at the bottom of the well. I refused. Tymvaul is probably dead, and even if he isn't, the matter is none of my concern. 30 After listening to Lassnr's heart-breaking tale, I have agreed to venture into the Rimhull ice caves in search of his son, Tymvaul. Lassnr has given me the key to his well, which is the quickest way into Rimhull. But he also believes there must be another, more direct entrance somewhere outside the village. When I find Tymvaul, alive or dead, I'm to return to Lassnr and report my findings. 40 I've located Tymvaul, and he's very much alive. He's also quite mad, thanks to the ancient magical robes he discovered in Rimhull. It seems Tymvaul JUMPED into the well in search of the robes' dark power. 50 I convinced Tymvaul to give me the Mantle of Woe. He will leave Solstheim and study magic somewhere, and return some day to make his father proud. I should return to the Skaal Village and give Lassnr this good news. 100 Finishes quest I returned to the Skaal Village and told Lassnr what happened to his son, Tymvaul. 110 Finishes quest I have slain Lassnr. This page was last modified on 29 January 2018, at 22:43.